Excellent advice on choosing the best camping stove for your needs, with camp stove buying tips, and information on the coleman stove , camping propane stoves and other stoves such as multifuel stoves and more. o	How many people will it feed? How light does it need to be? Fuel limitations, are you using it to travel? o	Camping Propane or pressurized gas. Simple to use, not good for cold temperatures. o	Naptha (Coleman stove, White fuel)- fuel can be poured into canisters by you, to re-use the canisters. o	Multi-fuel camping stoves- good for travel. o	Alcohol stoves- usually diy type stoves. The Single burner Coleman Duel Fuel stove . There is also a white fuel version of the same stove, that fills with naphtha (white fuel) camping fuel only. This is my favourite stove to use. Why? This Coleman stove is simple to use, plus it’s all in one piece, is pretty stable and works well. Plus it’s reasonably priced. Since suggesting this coleman stove to my mom, she’s had several campers notice how good it is for her and have purchased this coleman stove themselves. It is the best camping stove for her and many other campers. If you want a lighter stove, and don’t mind paying a bit more, another camp stove is the Primus or MSR single burner stoves with external fuel sources. These are stable stoves that can pack up smaller and are excellent for backpacking. Lightweight collapsible stoves such as the MSR WhisperLite, or the Primus Omnifuel stove are great options for interior camping as they pack up small and are light weight. These stoves use camp fuel (and sometimes other fuel types too) with reusable aluminum camp fuel bottles so you can bring as much or little fuel as you want and don’t have to worry about finding camping propane bottles to replace. These are great little multi-purpose stoves. Read reviews or purchase the Whisperlite now! If you travel, then you need to be able to get a camping stove that can use different types of fuel that is available in different locations. There are stoves that exist that that can use different fuels. One stove that uses multiple fuel types is the Primus Omnifuel stove. It can use LP gas, gasoline/petrol, diesel, kerosene and even aviation fuel! Another that uses different fuels is the Whisperlite Internationale which runs on white gas, kerosene and unleaded. Plus, their small size lets you not have to worry about weight at the airline. There are other companies that make similar small camping stoves, but the single burner style is great for most camping styles. Coleman 2 burner stove is reasonably priced and is one of those classic camping articles that just never seems to go out of style! I know people who’ve had their classic 2 burner coleman stove for decades, and the only thing that they need to change is the rubber gaskets (since rubber rots). This is the stove that I grew up with camping as a child. It is best for larger groups and drive in camping. I do know people that have taken these interior canoe camping for large groups, but in my opinion, if you need 2 stoves, bring two of either backpacking stoves or the single burner coleman stove (read above). Propane or gas canister stoves are simple to use since the gas is already pressurized. 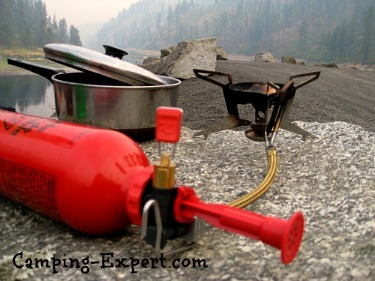 However the camping propane fuel will cost more in the long run than fuel with the other stoves above, plus they are not good for travel as the fuel canisters may not be available in all locations.I, personally, do not use propane or gas canister stoves. You may need several canisters for a trip, or the canisters may not be available where you camp.In the past the canisters could not be recycled. The canisters can now be recycled at a local recycling store. Find your local place here, at earth911.com. Type ‘steel’ and enter your zip-code. or Www.RecycleAerosol.com which recycles many propane tanks. Don’t throw the canisters in the garbage. Either bring the canister to a refill centre, or to a recycle centre. Yellowstone started their own recycling program. With a growing number of recycling programs available, camping propane is becoming more environmentally friendly than it has been in the past. Make sure that you keep the environment in mind when you purchase camping gear, or use one of the other camping stoves listed above to avoid the hassle of finding a local recycling centre. Overall, what would I recommend as the best camping stove? Check out reviews on the stoves or purchase one of these recommended stoves now! I love to travel and like lightweight, simple and environmentally friendly that’s why those are my favourite and best camping stove choices. Pick the stove based on your needs as addressed above. I hope that these camp stove buying tips have helped you to chose the best camping stove for you. Wilderness Recipe ebook - I created this book to share all of my favourite camping recipes that I have used over the years of canoe guiding.